Alejandro Picó-Leonís was born in the Spanish port city of Alicante. He graduated at the City University of New York in the class of Ubaldo Díaz-Acosta (a pupil of Alicia de Larrocha and Claudio Arrau) and visited masterclasses by Karl Ulrich Schnabel. After winning the Artists International Competition, he made his Carnegie Hall Debut in 2002, and was acclaimed by the press for his "enormous musical seriousness, his sense of style full of multiple colors and his beautiful sound" (El Diario). More performances followed at Carnegie Hall and among others, at the Auditorium of the United Nations. In Europe, he has performed in Austria (Graz, Salzburg, Musikverein Wien), France (Aix-en-Provence), Germany (Leipzig, Gasteig Munich), Spain and other countries. His career path took him to Vienna, where he studied with Norman Shetler and participated in masterclasses in Lied accompaniment by Graham Johnson. Alejandro Picó-Leonís was assistant of Gerold Huber in his Lied class at the Hochschule für Musik in Würzburg. He has performed with well-renown artists such as Francisco Araiza, Gerold Huber, Angelika Kirchschlager, Dame Felicity Lott and Miklós Perény. He is regularly heard in recital with artists of the "new generation" such as Manuel Walser, Bibiana Nwobilo, Yury Revich, Lisa Rombach and Gabriel Ureña. He has presented these artists and many others at his concert series "Lied im Schubert Geburtshaus", as well as in other historical venues around Vienna. During 2014 and 2015 Alejandro Picó-Leonís was Artist-in-Residence of the Beethoven Festival Vienna. His first solo CD "Variations" was released in 2011 by Oehms Classics. Further recordings for Oehms Classics, Odradek Records and Rondeau Productions. In 2012, his Oehms Classics recording with piano works by Mozart and Beethoven received the "Supersonic" Award from the classical music magazine PIZZICATO. 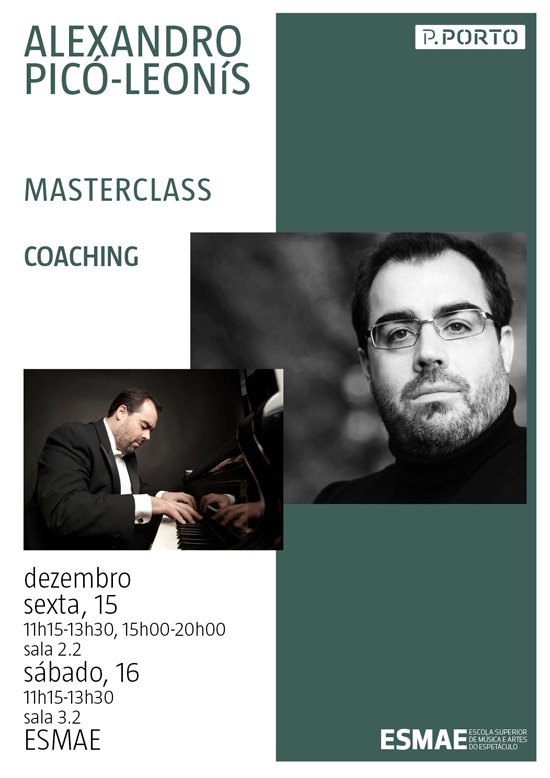 He has given Masterclasses in Spanish Art Song at the MUK Privatuniversität Wien. Lecturer at the Wiener Meisterkurse (2013-2016) and the Europäisches Musikinstitute Wien (2017). In February 2017, Alejandro Picó-Leonís performed Manuel de Falla's "Noches en los jardines de España" with the Brno Philharmonic at the Janáček Opera Theater in Brno (Czech Republic) and MuTh in Vienna (Austria). Upcoming concerts in Vienna include recitals at the Ehrbar-Saal, among others, with the Swiss baritone Manuel Walser, and a recital with the Spanish soprano Susana Cordón, "Das Alte Spanien", which will close this year's Fazioli Concert Series at the Old-Town-Hall. This summer Alejandro Picó-Leonís will perform at the Carinthian Summer Music Festival and will be Lecturer at the European Music Institute Vienna at the Laudon Palace.